to a heavily managed ninth-order river (PNNL, River Corridor SFA: Columbia River Use Case). The three regional SFAs share a long-term objective of elucidating how surface water/groundwater exchanges across a range of temporal and spatial scales control watershed-scale biogeochemical cycling. developing multiscale strategies that allow coupled hydrologic and biogeochemical processes to be represented at their native scales but expressed at watershed scale, rather than the current status of hydrologic modeling at large scale and biogeochemical modeling at smaller scales. Scale across the SFAs to provide an integrated modeling framework that spans the United States at a relatively high spatial resolution. The CONUS Activity allows us to make connections between SFAs and to work from small headwater streams up to major river systems that encompass millions of square kilometers. The CONUS model connects our work to other national-scale modeling efforts and provides the ability to upscale to spatial resolutions relevant for global Earth systems modeling. Conversely, the rigorous reach-scale analyses conducted within the SFAs provide a testing ground to evaluate and improve the performance of national models. Bridge across the SFAs and develop the use of process-explicit reaction models for aqueous complexation, surface complexation, mineral dissolution-precipitation, microbially mediated reactions, microbial dynamics, and similar processes. 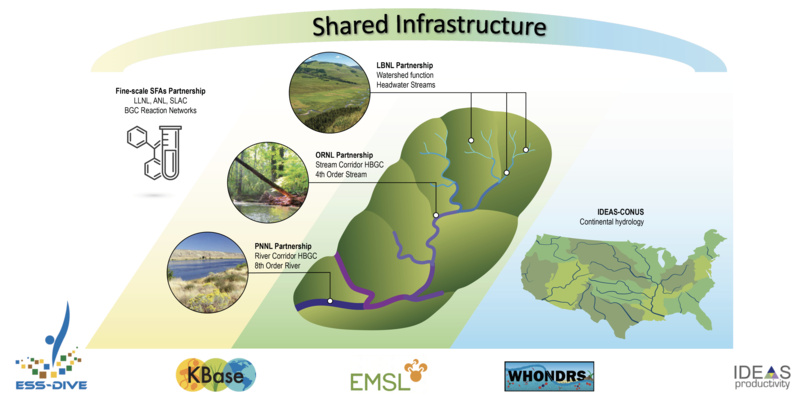 Extend the BER ecosystem of interoperable software tools and components to better represent hydrobiogeochemical processes in dynamic stream/river corridors along the river continuum. Provide software tools and workflows that can be shared among the SFAs as well as the critical (and currently incomplete) experience base on how to parameterize and use the new capabilities.